Imagine that you sit down for some evening television, and during the course of the evening, you see five commercials regarding dental products. They all claim to be the best. Then remember your last visit to the dental aisle at a local grocery store. The choices are overwhelming and there seems to be no sure answer as to which would be the best choice for your child. Morrow, Lai & Edwards Pediatric Dentistry recommends that parents break down the decision process. First, consider your child’s age and stage of development. 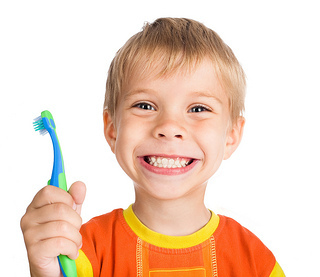 Up until age ten to 12, your child cannot adequately brush or floss independently. It is not a maturity issue, but rather dexterity. Automatic toothbrushes are highly appropriate for all ages. Brushing quality improves when using a battery-powered toothbrush. Use it together with your child, and always play an active role in your child’s oral home care. As a general rule, the brush head of the toothbrush should be a little larger than the child’s upper portion of the thumb. This will help ensure it will fit in all the places it needs to. Flossers are great for children. These will have a horseshoe shape on one end with floss in-between. A particular brand name does not matter. Some have a higher quality and this should be evident when you use them. You can make a choice for individual preference with color, handle size, or shape, etc. There are many brands of toothpaste and there are also differences in the ingredients. Some contain sodium fluoride, the standard ingredient in cavity prevention. Others have stannous fluoride, which is anti-bacterial and anti-cavity. Potassium nitrate is commonly found in anti-sensitivity, and triclosan is found in one particular brand for anti-bacterial properties. It is most common for children to be at a high risk for cavities. Therefore, our team at Morrow, Lai & Edwards Pediatric Dentistry recommends toothpaste with fluoride once your child is old enough to spit. Before a child can spit, use toothpaste without fluoride. This is an ideal time to use toothpaste with xylitol. Xylitol should be listed as the first ingredient; this way you’ll get the almost medicinal property of this natural sweetener. After you have found the right type of toothpaste, consider its flavor. The best kind of toothpaste is one that will be used, so choose a flavor that your child will love! If you have any other questions, our would like specific brand recommendation feel free to call us at Morrow, Lai & Edwards Pediatric Dentistry or ask Drs. Mark Morrow, April Lai, and Kerry Edwards during your next appointment!